Green brook residents and businesses, Green Brook EMS needs your help. Please come to town hall on Monday night at 7:30 to voice your opinion. Your mayor, township administrator and council have decided that having an all volunteer squad is costing the tax payers too much money. They are in the process of researching outsourcing this service to paid services under the guise of saving you, the taxpayer, money. The few cents on the dollar that gets allocated to emergency services will NOT make a dent in your tax bill. On top of this the service that once cost you nothing extra could now end up costing you upwards of $600. On top of this, it very possible that these paid services will not cover community events. If they do there will most likely be a fee involved. Our squad is made up of 30 very dedicated volunteers. We get up in the middle of the night because we have a desire to help our neighbors. We do this for free. We do not get paid. As volunteers we put in an excess of 70 hours a month of our own time. We miss holiday dinners with our families, we have lost our own houses to floods while saving and assisting our neighbors. Again we do this because we have a desire to help our residents not because we have to. All we are asking for is your help to keep our doors open. Please come out to town hall on Monday night @ 7:30 to let your mayor and council members know that you want to keep your volunteer EMS. This is the one time that we really need your assistance. Without your support we won’t be able to keep our doors open!!! Please come out Monday night! Green Brook Residents: Please VOTE! Polls are open until 8 pm tonight. If you live south of Route 22, vote at the Green Brook Middle School. If you live north of Route 22 on the far west side of town (i.e., west of Mountain Parkway – Scheurman Terrace, Brandywine Rise etc.,) vote at the Middle School. If you live north of Route 22 on the far east side of town (i.e., east of Washington Ave – West End, Blue Ridge, Interhaven etc.,, vote at the Middle School. If you live north of 22 in the middle – east of Mountain and west of Washington (i. e., Top of the World, Red Bud, Top Ave) vote at the Fire House by the Washington Rock State Park. Green Brook School Board has an open seat for a 3 year term. Please write in candidate JOSEPH PETRILLO. Thanks so much for your support in this election. What’s Not to Like about Sen. Barbara Buono? In today’s world of media short attention span no sooner is one issue raised in the gubernatorial campaign than it is quickly supplanted by another. We rapidly lose track of the totality – the many differences between the positions of each person. Let’s take a look at key issues and compare the two main candidates. Property taxes: She’s champions efforts to hold down property taxes by asking the wealthiest to pay their fair share. He does not. Miinimum wage: She supports increasing it and and indexing it to inflation. He does not. Earned Income Tax Credit – She supports raising it back unconditionally to 25%. He lowered it to 20% and uses it as a gimmick to further other ends. School education: She supports more funding for schools and seeks to protect collective bargaining rights for teachers. In his first year in office he reduced funding by $820 million and has been antagonistic toward bargaining. Environment: She supported the Regional Greenhouse Gas Initiative and wants to put an end to using waivers that allow polluters to dirty our air and water, and jeopardize public health. He does not. Marriage equality: She embraces it. He runs away from the issue, vetoes the legislative bill, and hides under his call for a public vote on the issue. Women’s health care: She supports funding for Planned Parenthood. He does not. Transportation: She supported the building of the ARC tunnel and understands the value of investing in our infrastructure. He ended ARC and he invests too little in our infrastructure. Gun violence: She calls for the reduction in magazine size from 15 to 10, an end to the private sale loophole, and a law requiring face-to-face sale of ammunition. He does not. Oversight: She has questioned recently the management of halfway houses and AshBritt’s debris removal costs. He resists oversight. Senator Barbara Buono lays out her positions on these issues in her web site. The incumbent governor, in his web site, preferring only to laud his accomplishments, does not. In a letter to New Jersey state Democrats last week, John Weisnewski announced that he will not seek another term as State Democratic Chair. He thanked New Jersey Democrats and encouraged all to show their support for the to-be-announced incoming chairperson by contributing to the party. Weisnewski’s term as chair ends in June. He is on the ballot for re-election as Assemblyman in the 19th district in November. We’ve been complaining for years about the lack of responsiveness from town hall…well, now Governor Christie knows about it too. Read this article about Governor Christie’s comments today in a town hall meeting in Middlesex. The Township will NOT be picking up general storm related garbage (i.e. fences, siding…etc), only storm related tree debris. This clean-up will be a massive undertaking for the Township’s Department of Public Works. We ask that you please be patient with this process. A schedule for tree debris and leaves (previously published leaf schedule is suspended) will be forthcoming and will be posted on the Township’s Web site. Courtesy of the Watchung-Green Brook Patch, here’s the official list of voting locations in Green Brook. 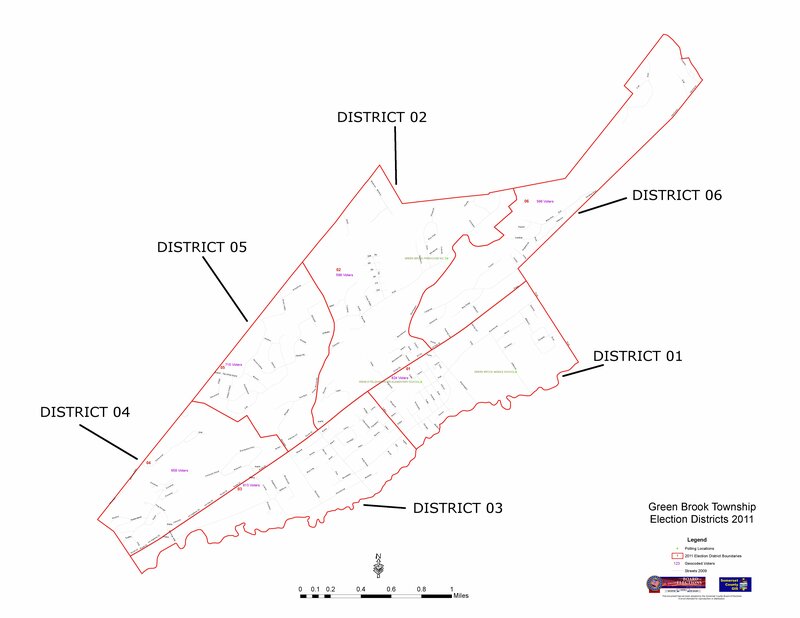 Note voting locations have changed in some districts. Please check the list and check the map. 1 Green Brook Middle School, Jefferson Ave.
3 Green Brook Middle School, Jefferson Ave.
4 Green Brook Middle School, Jefferson Ave.
6 Green Brook Middle School, Jefferson Ave.
On Monday, Nov. 5 , the Somerset County Clerk’s office will issue mail-in ballots from 8:15 a.m. to 3 p.m. The statutory deadline to accept mail-in ballots is 3 p.m. Monday. Residents who pick up a vote-by-mail ballot Saturday, Sunday or Monday will be able to complete it and drop it off at the Board of Elections, located next to the County Clerk’s Office. The office is located on the first floor of the Somerset County Administration Building at 20 Grove Street, Somerville, N.J. 08876. Residents should come in person to pick up a vote-by-mail ballot. For further information, call the Somerset County Clerk’s Office at (908) 231-7013. There is free parking in the Bernie Field Parking Deck, which connects to the county building on the green level or enter on East High Street. If your usual polling place has electricity, you should be able to vote there on Election Day. The state has required that all county clerk offices remain open this weekend from 8:30 a.m. to 4:30 p.m. to allow voters to vote early by absentee ballot. Although we are all preoccupied with storm related matters, we can’t forget that tomorrow, Tuesday, is election day. The polling place for Green Brook District 3, which is South of 22, West of Kaffka, has been moved to the Green Brook Middle School at 132 Jefferson Avenue, Green Brook. Please share this information with those that it may affect. Help us get voters out to support Tom Tsivgas and Dave Breen and the rest of the Democratic ticket. We need your vote and we need your support. P.S. Please put your signs back on your lawns too.